Our highly safe and efficient Bio ethanol fireplace fuel is sold in 1 liter quantities of a 6, 12 and 24 pack. This ethanol fuel for fireplaces is the cleanest burning smokeless fuel on earth. It provides the most exquisite fire while complying with all of the safety rules, regulations and guidelines. Moda Flame ethanol fuel is composed of water vapor and very minimal amounts of carbon dioxide, extremely similar to our human breath. Moda Flame ethanol fireplace fuel leaves no oily residue in the tank and releases clean, safe and odorless fumes. Moda Fuel produces the most beautiful yellow flame with orange and blue accents. This fuel has the longest lasting burn time of alcohol fuel on the market. A child safety, BITR is added to the fuel, which has a very overwhelming bitter taste that helps to prevent accidental ingesting by children and animals. 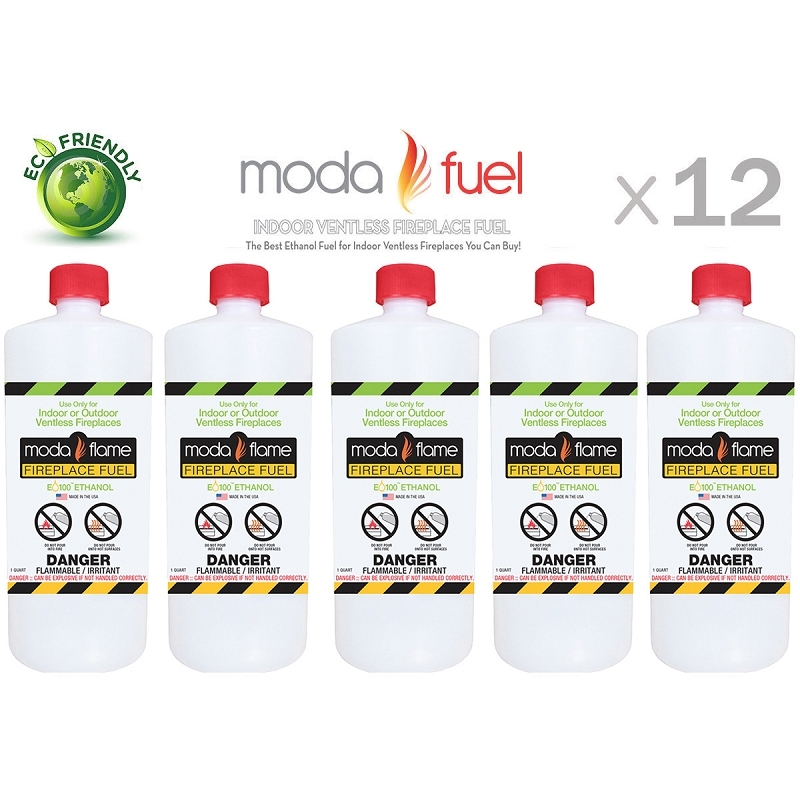 Another great feature of our Moda Fuel is the safety-pour technology in the cap of the bottle, which helps to provide the safest possible flash- free transfer of fuel from the bottle to the fireplace tank.